First quality bamboo stakes imported from China. 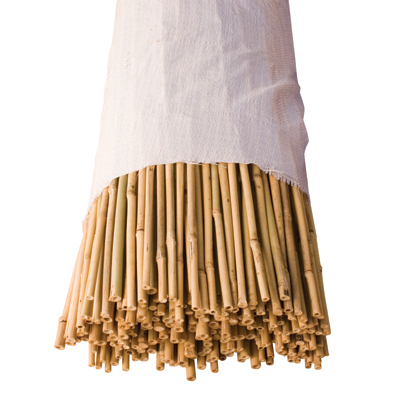 For staking tubing and netting our bamboo comes with a natural finish that is incredibly strong and won't soak up moisture. As a tubing or netting stake, bamboo has been used successfully for more than 25 years by private timber companies, state and federal forest agencies and small woodlot owners. Since the time involved in importing containers of bamboo can be lengthy, we normally stock good quantities of popular sizes in our warehouse but always recommend you call us well in advance to make arrangements for large orders. Quantity pricing generally starts at 5,000 pieces. Other sizes available by special order. Please call Toll Free for a quote (877) 736-5995. Orders of less than a full bale may be subject to an additional 3.00 broken bale charge added to the invoice. Price listed is per piece.